The following article will address the 2 forms of dress on which I have focused the last few years; the robe and the mantle. The Sasanian robe is my preferred form of dress as it is comfortable and is less fussy than the mantle. I love the look of the mantle, but it is not the most practical garment. Admittedly the more I wear it the more comfortable I am with the garment and the less it falls off or trip on it. :) I will also discuss in this article the variations I have tried over the years and analysis of how each differs in look and functionality. The image, left, is one example of the robes worn. This silver and gold plate is held in the Freer-Sackler Gallery, item number S1987.113 . Goldman (1997) suggested this was a banquet scene and may even be a coronation scene. This is the inspiration for my own Coronation garb for my stepping up as Queen of Drachenwald. 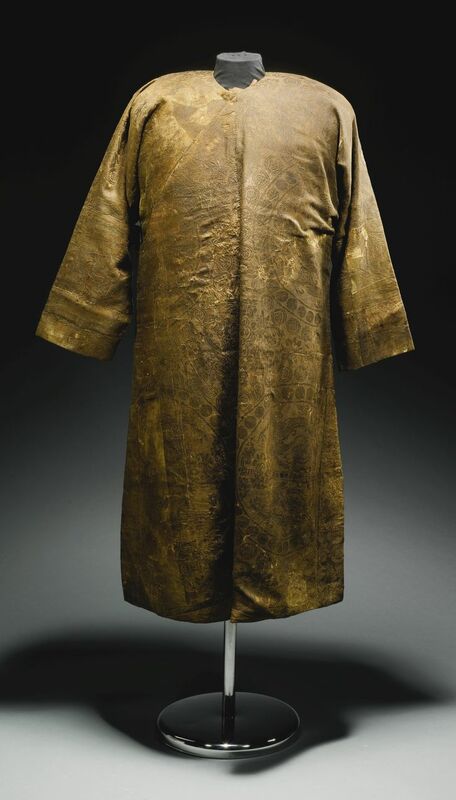 Robes feature heavily in Sasanian court proceedings, most references of a noble receiving a new position/honor state they received a "robe of honor" to mark their accomplishment. This plate needs to be closely examined to see that the woman is wearing a robe. (Please click on the image to enlarge it.) The sleeves are worn off the shoulder, which is a common was women wear robes in Sasanian silver works and rock carvings. This makes it very easy to mistake robes for cloaks. The Relief of the Investiture of Khosrow II from Taq-e Bostan and is one of many such carving depicting the coronations of Sasanian Kings. The reliefs were carved in the 7th C AD as part of the Sasanian Renaissance. The woman in this image is also wearing a robe. She also wears the robe in a cloak style, but the sleeves are distinctly hanging down at her side. Musee Historique Tissue in Lyon France. I have not studied the coats myself at the museums as other researchers have made information about the coats freely available online. I have focused my research travels on studying textiles that are not as easily accessible online. The green coat can be seen here. The red coat can be seen here.These two coats have front panels, one of which overlaps the other. The coats also do not have side seams, but rather the front panels wrap around the body to the back and attach to the back in a curve. I have made a number of robes over the years. This article will reflect on 4 different construction methods I have used in the 20 years I have been making Sasanian costumes. The earliest model was based on what can be called the T-tunic construction method. When I made this robe, I was cutting my dressed out by folding the fabric in half vertically and horizontally and cutting along one line. I made my green wool Robe, I cut out a much larger version of a dress, and cut it up the middle. Once I came across the Persian riding coats held in Lyon, I began experimenting with the curved back cut. I have made many coats using this method. It does require a second set of hands, to properly tailor the curve and pin the front layer to the back. My experience with trying to pin the front to the back of the body is that the area below the waist bulges oddly and is not satisfactory. For my Coronation, Mistress Rogned used this method for my Coronation robe. As she was able to fit the back to my body, it does fit well. It hangs nicely and is quite comfortable. I have written an article solely on the research behind my Coronation garments and the King's Coronation garments, including the hats. 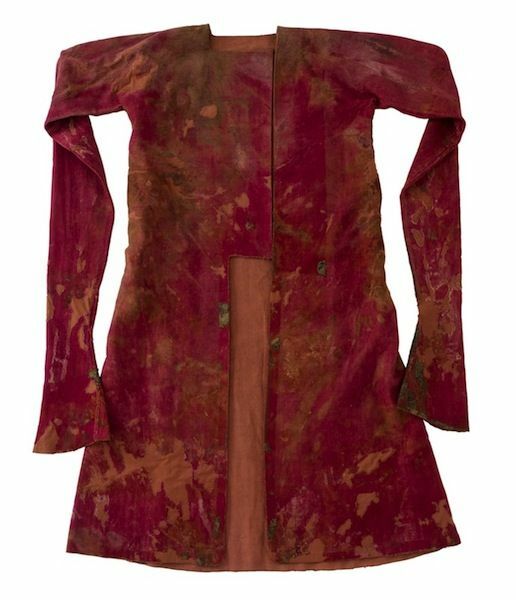 When studying a robe sold by Sotheby's, it appeared to be cut in one main body piece with additions made to the sleeve length. The underarms are not well photographed in the listing, however, it looked as if the sleeves and body were cut very square. Lord Elgrimr and I tried this method as well. He cut the green silk out for me and I sewed the garment together (see below). This resulted in strange gaping in the sleeve area. Duchess Fiona kindly took the robe and curved the sleeves for me, this has fixed the problem. I, therefore, do not believe that the arms were ever cut at a 90-degree angle to the body of the robe. Once properly fitted, when worn open all the robes look that same to me. The curved seam construction is the only one I have solid evidence for, but I do agree with scholars who wisely point out this was likely not the only style of robe construction used by the Sasanians. More research is needed to give a more definitive answer to the question of which other methods were used. My experiments have only shown that there are a variety of cutting methods and fabrics that achieve the same look and feel in the final product. This example shows a silver gilt bottle held at Freer-Sackler Galleries followers of Dionysis's cult. This depcition shows a woman wearing a mantle that is commonly seen amoung depictions of noble women. Goldman (1997) included examples of 3 ways women draped the mantle around their body. Goldman (1997) also studied a silver dish held at the Walters Art Gallery, this dish can be viewed here. Goldman (1997) stated that he believed this mantle was based on the Greek himation or pall, rather than the Indian sari. I support this assertion, as the Sasanisn period comes after the Greek rule over this area. I have also not had time to research the origins of the sari and do not know when the sari comes into use in India. The mantle could have been a rectangle of fabric; 1) wrapped once around the torso, up and over the left shoulder going from front over the back , 2) wrapped once around the waist over the shoulder from back to front on the left shoulder and bunched up on the shoulder, or 3) the same as 2, but not bunched on the shoulder with the mantle covering the arm. I have come back to this look several times over the years. So far I have determined that the minimum length needed for me to create such a mantle is 3 yards. I have tested this look with 2 different lengths and different ways of wrapping. I have tried the sari wrap style, which means tucking the fabric into a belt. After reading Goldman (1997) again, I noted his description of these warps refers to both the Roman palla and Greek himation. After some research of how the Greek Himation was wrapped, I have tried that as well. I have tried both wrapping methods with the wrap just over the shoulder and with the wrap also working as a veil. At Cudgel Wars HL Constanza kindly helped me wrap a length of sari fabric in the himation style with a veil. This I chose to use sar fabric for most of my tests, because it has a woven in overall pattern, as seems to be indicated by the historical example. I have studied several textiles from this time, which are woven samite. The sari fabric is woven brocade, which has a more delicate wrong side than samite, but has a similar heft to samite. I feel this does give the same look and feel as the historical examples. I wrapped this example myself, also at Cudgel Wars. Although the wrap appears shorter than the silver work shown above, when seated it does come to below the knees as seen in the Walters Plate. This has become my prefered method of wrapping a mantle. The Sasanians took their lands back from the Greek invaders. It is therefore quite believable that this clothing style was an adaptation from the time of Greek rule. In comparision the sari style clearly shows 2 layers in the front. The wrap appearing left was wrapped for me by HL Edith. It is a beautiful style, but it is not the same look depicted in the Sasanian silverworks studied. Photos of fellow SCA members used by permission.